"We Care, We Listen, We Get Results"
I want to personally welcome you to Full Motion Chiropractic. After over 32 years in practice, I’m more excited than ever with the “Next Generation Chiropractic Care.” Based on recent research in spinal care, there has been an AMAZING breakthrough in our care! What this means for you is that if you come in to see me and I find out your needs and I do my examination and after that if I say I can help you, you'll feel a result on the very FIRST ADJUSTMENT! You will know that you're well cared for and you will see and feel the difference. How much better? At least 50% TO 100% BETTER!! How can I dare say this???? On the very first adjustment??? Yes, we’re THAT GOOD. I know this sounds crazy…it does to me too to be honest with you, but that's what has been consistently happening at my office. You will be able to verify the results yourself. If you’re experiencing pinched nerves, severe pain, disc problems, herniated disc, sciatica, even scoliosis, I am confident our care will help you get results you're looking for, free from pain! Call us at (650)-365-7775 today. Welcome to Full Motion Chiropractic! Our specialty is to move our patients from pain or discomfort to wellness. While many of new patients come in because they have been chronically suffering from pain, many come for acute injuries. We provide non-surgical treatments for common conditions such as back pain, neck pain, pinched nerves, disc problems, headaches, numbness and pain down the legs and arms, carpal tunnel, fibromyalgia, and many more using chiropractic care. Dr. Harry Wong is the clinical director of Full Motion Chiropractic and brings with him over 30 years experience in the field of chiropractic and alternative medicine. He has been director of chiropractic and medical centers in the bay area. He is a Diplomate with the National Board of Chiropractic Examiners. Dr. Wong has authored several publications for his field including "Spinal Motion Analysis on X-ray," and "Instrument Adjusting Technique." 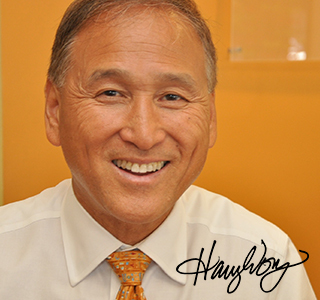 He is also the host of two television shows; "Life Matters with Dr. Wong," and "Better Health Through Chiropractic." Dr. Wong is also one of the nations top experts on detoxification. Dr. Wong has extensive post graduate studies in nutrition, radiology, neurology, sports injuries, biophysics, whiplash and work injuries. He is also one of the few certified in the use of Diagnostic Ultrasound to diagnose complicated and difficult back and neck cases. Having been on over 500 radio shows, Dr. Wong continues to educate patients on health. Dr. Harry K. Wong, D.C. is here to help! For more information or to schedule an appointment with our Belmont chiropractor, call (650)-365-7775 today! Why Did This Patient Fly Over 6,900 Miles To Come See Us?